These classmates are no longer with us. Given the size of our class, it doesn't claim to be a complete list. If you have additions, corrections or a memories, please send them to me. Robert and his friend, Jim Post died too young, in a motorcycle accident in the summer of 1964. Bob is buried with his father, a WWII veteran, in the Golden Gate National Cemetery, San Bruno, California; Plot Z, 0, 112. You can see his entry on Find-a-Grave. Lafayette - Two Concord teenagers on a motorcycle were killed last night when they smashed into a flagstone driveway pillar at 746 St. Mary's Road. Bodies of James Post, 3694 Hillsborough Dr. and Robert Shank, 1237 Glenwood Dr., were not discovered until 7:10 am today, when Mrs. Ross Beason noticed the wreckage as she drove by. Both youths were 16. Highway patrolmen estimated time of death as being shortly before midnight. They had been visiting at the Raymond O. Horning home, 710 St. Mary's Road, until about 11:30 last night. They left on Shank's motorcycle and were not seen again. The northbound motorcycle may have hit a rough spot in the road and gone out of control, investigating officers said. Both victims were thrown from the cycle on to a driveway. Robert Waddell, 07 Dec 1947 - Dec 1977. Ron Pimentel, 17 Jan 1948 - 01 Sep 1968. PFC Ronnie Cardoza Pimentel was killed while serving with the 198th Light Infantry Brigade in Quang Ngai Province, Republic of Vietnam. Rosemary (Greenway) Frager, 19 Nov 1948 - 26 Jan 2001. Rosemary lived in Concord, Mill Valley and Sonoma. She was a docent for Guide Dogs for the Blind and enjoyed teaching art to children, painting and sketching. She left her husband of 26 years, Arne; one daughter, two sons, two brothers, two sisters, two grandchildren and her parents. Rose was a wonderful artist and everything she did sparkled with her fabulous style. She lived well and loved well. Her family and friends miss her greatly. She was diagnosed with cancer in August 2000, and lost her battle this January. We treasure her artwork and the wonderful memories she left. Russell Gephart, 1 Dec 1947 - 25 Feb 1993. Russ passed away suddenly at the young age of 45 due to an unforeseen heart condition called hypertrophic cardiomyopathy. There was a local service held in Fremont, CA (where his family lived for many years) and a second held at the site of burial. He was a Sergeant in the United States Air Force and is buried at the Golden Gate National Cemetery in San Bruno, Califonia. He is survived by his wife, Joanne, his sons Russell and Gregory, and his daughter Cassandra. Since then, he has gained two daughter-in-laws: Victoria (married to Russ) and Tiesha (married to Greg) and two beautiful grand-daughters plus one grandchild on the way [in May 2005]. We remember him fondly for his inventive parenting skills, his love of the outdoors, his love of family, and instilling in his children all of the above. Sandi (King) Owens, 1948 - 15 Jan 2004. Sandi died of pneumonia. Her family is deeply saddened and miss her in every moment. She left a daughter Julie, a husband Steve, and another two sisters, Karen King (CVHS 1964) and Nancy King (CVHS 1968). Sharyl (Hutting) Carrier, 1948 - 27 Nov 2006. Sheryl Hutting Carrier passed away November 27th after a long illnes. She passed quietly, with her husband and daughter by her side. In 2004 Sharyl wrote: I live in Chico, California. Still a homemaker, even though the kids have left. Now is actually the best time to stay home. It's so nice and quiet again. Not very exciting, but we're happy. Starr (Burnside) Mueller, 1948 - 13 May 2013. 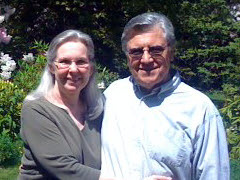 Doug Mueller writes: My wife Starr passed away on May 13, 2013 from a rare type of melanoma. We had been married for 39 years, retired to Whidbey Island in 2006, and together we have one son, Brandon, born in 1978. Starr knew what was coming and wrote a short goodbye letter to her family and friends in lieu of an obituary. Doug very kindly sent me a copy, and a wonderful picture of Starr and himself in 2008. Hers is a story of grace, courage and dignity. See them both, but be warned - have a tissue handy. If you have any feelings in your heart, you'll weep. I did. Stephan (Steve) Joe Mashore, 11 Feb 1948 - 18 Nov 2013. Stephan was born in Concord, California, and lived in Northern California and Reno area, spending the last several years in Anderson and Redding. Stephan was a Marine Corps Veteran. After his return from Vietnam, he trained as a baker. He was in charge of Holiday Market bakeries for many years. Stephan is survived by his father and step-mother, Ray and Rosemary, his brothers and their wives, Gary and Margaret, and Richard and Carol, his son, Stephen, his daughters, Sunshine and Melinda, and five grandchildren. Internment at the Veterans Cemetery in Igo, California [9 miles west of Redding]. She loved doing things for her family. Susan was born in Little Rock, Arkansas. She did home care nursing and had her own cleaning business. She is survived by her husband, Brad Wesson, daughters Maria and Wanda, sons John and Donald, four grand children, an aunt, three brothers and a sister. Read Reflections on the Big Chill, an eloquent and moving piece by Doug Perez on time and classmates passing.